Download the latest firmware 5.0.4 HERE to ensure top performance and drive reliability. Great price/performance ratio. Supports SATA 6G. The Mushkin 120GB Chronos Deluxe is another great SSD option for cost-conscious buyers. To sum it all up with a bow on top, you get amazing performance, extremely long service life and a hassle free low price point on a drive that literally has very little competition in the marketplace. Mushkin's Chronos Deluxe 480GB is the all around SSD. It offers high performance, a lot of storage capacity and best of all it's priced within reach of most enthusiasts. The Chronos Deluxe 240GB sat comfortably close to the top on most tests when it came to performance, which is certainly impressive by any measure, especially in a drive facing off against big boys like Intel and Samsung. At around $255 it sets a new standard where enthusiast level performance is now finally well within the reach of most consumers. What’s not to like about that? This new design has revolutionised the performance sector delivering class leading results with both incompressible and compressible data. 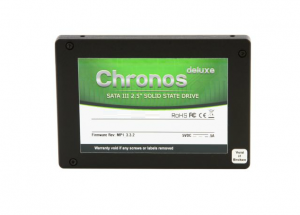 Both the Chronos and the Chronos deluxe turn out to be among the most affordable SSDs in their respective categories. The Mushkin Chronos Deluxe 7mm brings down the size, but in no way does it bring down the performance. The Chronos DX7 is every bit a top tier SandForce based performer, but comes in a package that will allow ultrabook users the opportunity to take advantage of this performance. With all of these SandForce drives there are more or less three different types or classes of SandForce-based drives. Starting at the bottom you have drives that use 25nm asynchronous flash. A step up from that is the 25nm synchronous ONFi 2.2 flash. Finally at the top tier you have 32nm synchronous toggle mode flash from Toshiba. Of course the drive we reviewed today, the Chronos Deluxe from Mushkin uses the toggle mode flash from Toshiba. Mushkin has clearly improved on things from when we took a look at their Callisto Deluxe, their new Chronos Deluxe 7mm topped or matched the competition in most of our benchmarks and just plain dwarfed the Callisto’s numbers.